Art-ify The first of six vinyl utility box wraps are up (4th & Cherry). We know people will be thrilled with the bright, welcoming and vintage art – thanks to Patrick Ferrand! And then worry about grafitti – well graffiti happens, as does anti-graffiti covering. So don’t despair! 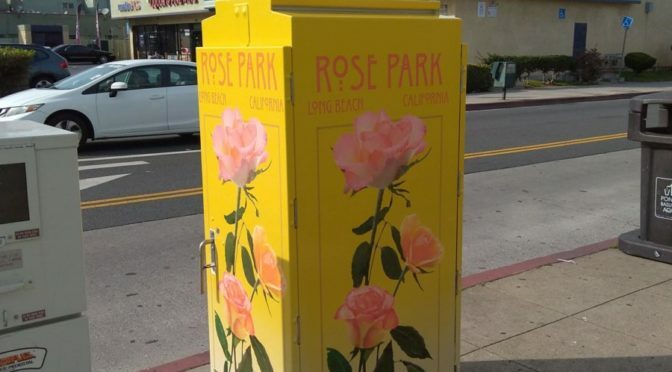 Karen Hewus, Look Graphics – our very own Rose Parkian fabricated these and will continue with the installation. Alarm-i-fy Jan 30th at 10 & Orizaba – #AlarmYourself2 #IDigFeelingSafe had an overwhelming response. 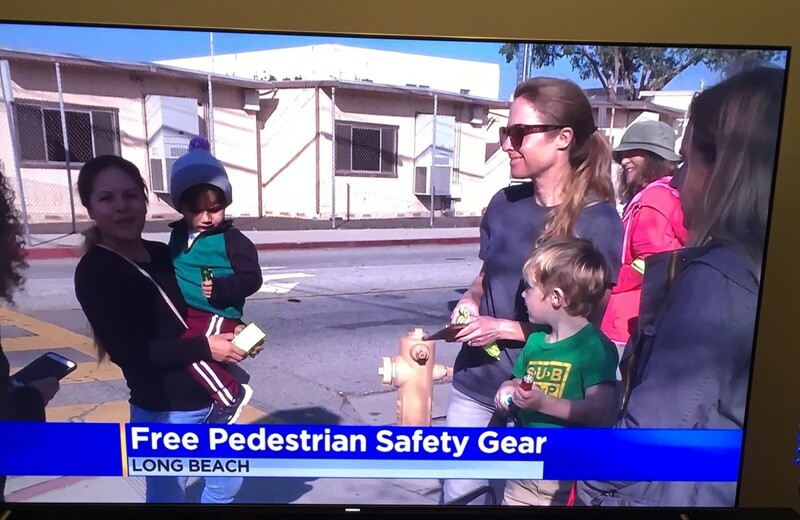 ABC News was out to capture the gifting of a new safety vest to our crossing guard Im T with Councilmember Supernaw CD4 and Devin Ablard and Karla Estupian with CD2. Then we captured RPNA gifting Safe Refuge with safety vests and rain ponchos for the Clean Team – their community give back to Rose Park. And it went on! Each participating organization was given a side saddle bag outfitted with safety garb to hand out to those walking the streets. We gave out hundreds of flashlights thanks to Heart of Ida. Rose Park Neighborhood could not have done this without the support of the Port of Long Beach, Heart of Ida, CD2 and CD4. PLUS LBPD East, Gray Panthers, Donna from Senior Center, and Rose Park volunteers!!! All left messages on the ‘message board’ on “What makes me feel safe”. We’ll be sharing these thoughts in near future. One grandmother with child in stroller turned back before crossing the street and said “I really appreciate the neighborhood doing this for us”. That made our day! Engage: Want ways to do things – here is a great start! The class presented by Rain Barrels Intl. will discuss the importance of rainwater harvesting, the benefits of a rain barrel, the installation process, helpful methods to conserve water on your property, and rebate information. The Metropolitan Water District is currently offering all Long Beach residents a rain barrel rebate of $35.00 per rain barrel. This rebate is good for two (2) rain barrels per household. Rain Barrels are available for purchase at a community event price of $65.00. + tax. These rain barrel purchases along with your reservation for your spot at the seminar should be made in advance. More information can be obtained at the website below or contact Rain Barrels Intl. at 919 602-6316. The rain barrel distribution will be from 9:00 to 11:00 a.m..
We’re super excited to announce AOC7’s 7th Annual Book Drive and Literacy Fair on Saturday, May 11, 2019! In the past six years with your help we have been able to distribute 30,000 new and gently used books to children at MacArthur Park in Long Beach. We would love to invite you to partner with us for another amazing year. Here are several ways you can partner with us either for the Book Drive or at the Literacy Fair. Donate new or gently used children’s books. House a book collection box. Help sort books in April. Donate funds to the fair for decorations and raffle prizes. Host a table or booth at the literacy fair. Read at the literacy fair. Volunteer at the literacy fair. Previous PostHad to Reboot – #AlarmYourself2 #IDigFeelingSafe Street Action Reschedule Jan 30thNext PostGoing Enviro to downtown LA? or around town?